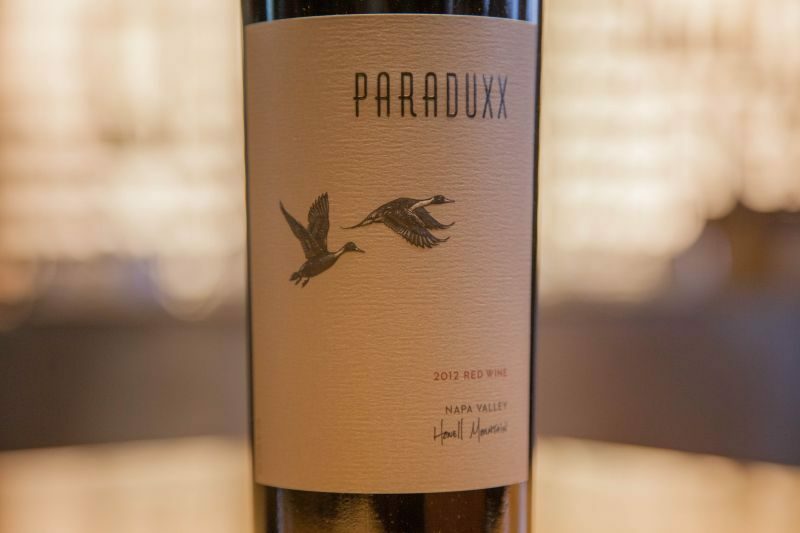 We recently visited Paraduxx, a winery on Silverado Trail that is part of the same group as Duckhorn. They have beautiful gardens in which you can taste, but on the day we visited rain was lashing down, so we sat inside. 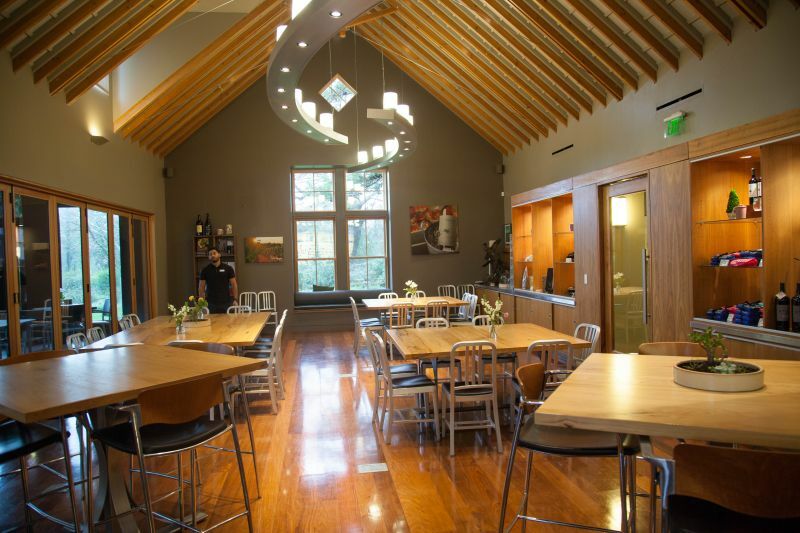 The tasting room is modern, built in 2000. 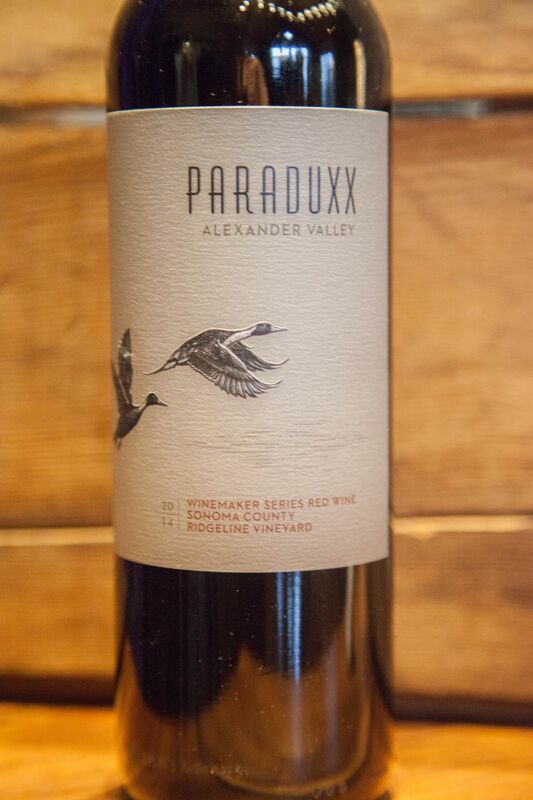 Paraduxx has been making their wines, which are largely Cabernet Sauvignon and Zinfandel blends, since 1994. California Girl comments: It was a wet, miserable day. Napa was absolutely soaked so unfortunately there are no photographs of the gardens which are lovely. When we checked in we were given a glass of their 2015 white; a Viognier/Chardonnay blend. The wine is 100% stainless steel and sells for $30. The nose was restrained, but there were hints of peach. The flavour had more character than the aroma, with mixed citrus balanced with honey. This is an easy drinking white wine; ideal for a warm summer’s day, but enjoyable on a rain-lashed winter’s day too. Our host Jeffery sat us at a table. He said that one should sit down to taste wine, as the only time one drinks wine standing up is when you are cooking. He brought us the complete tasting flight, with notes and a map of the valley indicating from where each wine was sourced. A plate of cheese accompanied the wine. It was a cheese coated with coffee and lavender; delicious and well-matched to the wine, despite the unexpected nature. We were so impressed that we asked for where we could buy the cheese. It is called Barely Buzzed and is from the Beehive Cheese Company in Utah. We were able to purchase it from Whole Foods in Napa. California Girl comments: Whilst we were there to taste the wine I have to comment on the amazing cheese. Our group went crazy over it and we went out later that day to purchase some. It is a great complement to the wine. Delicious. 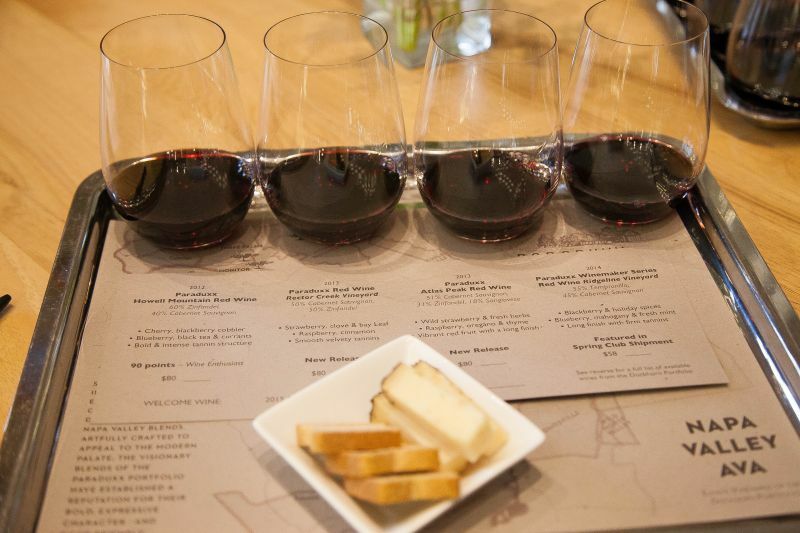 The first red we tried was the 2012 Howell Mountain Red ($80). This is a blend of 60% Zinfandel and 40% Cabernet Sauvignon. The nose presented leather and cherry. The first impression was of heavy tannin. A second sip allowed me to discover dark berries mixed with pepper. I think that this wine needs age before I would enjoy drinking it. The next wine was the 2013 Rector Creek ($80). This is a 50/50 blend of Zinfandel and Cabernet Sauvignon. Here the nose was distinctly fruity, with plums to the fore and notes of pepper wafting up from the wine. The flavour was of licorice, cherry, and pepper. The finish was beautifully sweet. The third red was the 2013 Atlas Peak, which sells for $80. Here the nose was of plum and chocolate. The flavour was a well-balanced mix of leather, black currant, and black tea. This was our favourite of the flight; enjoyable now, but with the potential to age. This wine was a blend of Cabernet Sauvignon (51%), Zinfandel (31%), and the rest was Sangoivese. California Girl comments: I love Sangiovese and I love Atlas Peak. A match made in heaven for me. I loved this smooth, lush sip. It would pair well with any food, but I have to say I could really imagine it with wild boar or ostrich. The final red was The Paraduxx Winemaker Series Red Wine from the Ridgeline Vineyard. This was the only one of the four wines in the tasting that had no Zinfandel; being 55% Tempranillo and 45% Cabernet Sauvignon. The nose brought leather with fruit in the background. The wine had a soft mouthfeel, with vanilla and raspberry; the fruit faded with the finish. This wine sells for $58. We were also given tastes from a couple of wines that were not on the standard menu. 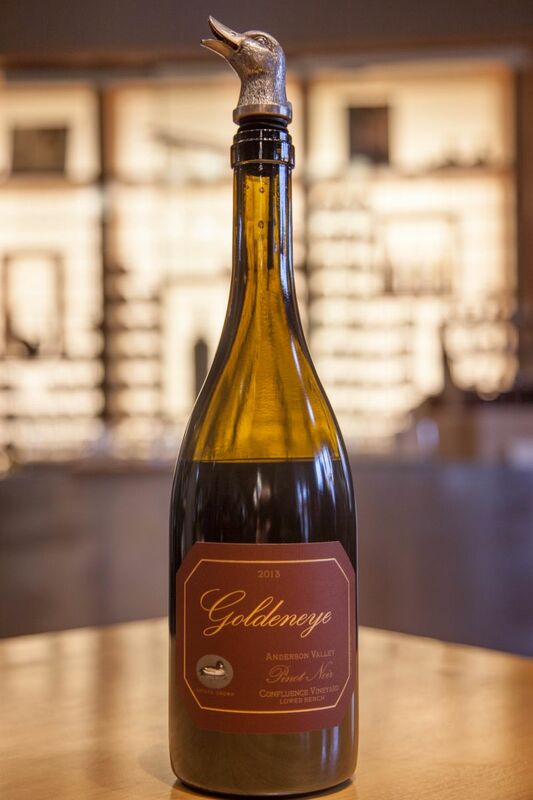 The first of these was Golden Eye Pinot from Anderson Valley. The nose was rich, with several elements; including plum, leather, and tobacco. Sipping it, I enjoyed a silky texture that led to a long finish with smoked meat, raspberry, and sour cherry. It was a very impressive Pinot Noir. California Girl comments: This Pinot Noir was truly a special occasion wine. Being a Pinot Noir, you would expect it to pair well with food, but this was something beyond a “nice” meal. It was weighty in the mouth, and you could simply taste the quality in every luxurious sip. Maybe Christmas goose as a pairing suggestion? 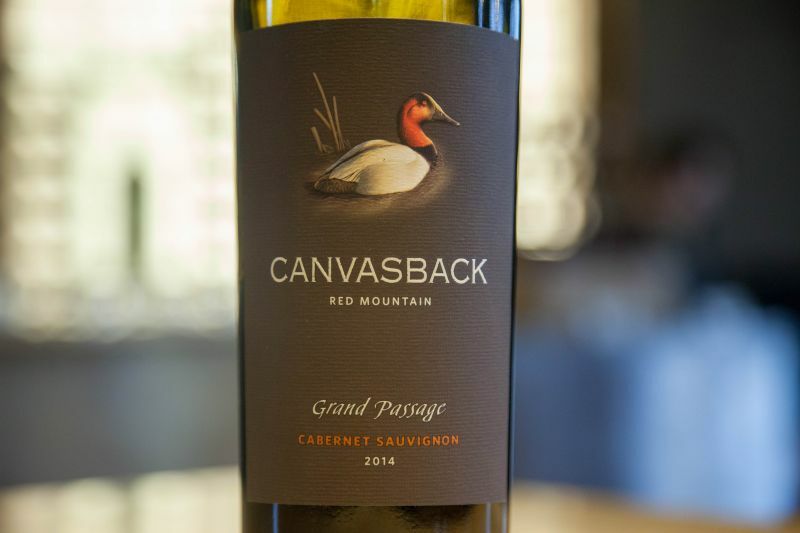 The final taste bore the Canvasback label and was a 2014 Cabernet Sauvignon from Washington. The nose was a wonderful impression of plum and pepper. The taste did not no justice to the enticing nose; dominated as it was by an aggressive sweetness. This was the only one of the wines that I did not enjoy at Paraduxx. California Girl comments: I think it was a little young but will come into its own. It was aggressive, but many people like those huge wines that makes a statement. This wine certainly does that. The tasting room was an attractive setting. Our host was friendly and informative. The wines were interesting and two or three were excellent. Definitely, worth making reservations if you plan to be in the area.